Earlier this week, I gave you several reasons why your law firm needs to implement a project management system. Presumably, you understood and agree that existing market pressures and client demands mean law firms need to streamline processes to be more efficient. Along the way, you’ll also get superior work product with fewer mistakes as a little side benefit. However, there are literally hundreds of project management tools available. 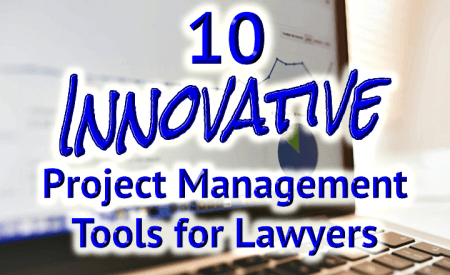 So here are my recommendations – 10 Innovative Project Management Tools for Lawyers. Task Management – Each one of these tools allows you to set project goals, broken into its component parts. Those parts can be divided into tasks and subtasks, and the completion of those tasks can be seen and tracked by most/all users. Task Assignment – They also all let you assign various tasks or sub-tasks to other users. Users will all know when they’ve been assigned a task, and can see the overall progress in the project. Basic Collaboration – All of these tools allow users to access important files and documents for the project. Essentially, they all perform project management, at least at a basic level. So what makes one better than another? I’ve identified these 10 project management tools because, first, they meet all the basic rules outlined above, but second, because they each bring something special to the table for their users. Asana is a jack-of-all-trades project management tool that provides all the basic functionality you’ll need, but without a lot of the frills found in other tools. As far as capabilities, Asana is simple but effective. With the ability to add functionality with a number of third-party apps and an available API, users are able to improve upon the basic functionality of the base program. Where Asana really shines is its communication system. Asana was built primarily on their task-based communication system, which allows you to track the progress and process of your tasks through the comments. It also means that any communication you have regarding the task occurs through Asana, rather than through email. Free Option: Yes – one user, Basecamp For Us package. Basecamp is a project management tool built around mobile use. Focusing on simplicity, Basecamp is a great tool for people who prefer visualizing their project management, or are looking for a basic, less-expensive system. Built primarily around their mobile platform, Basecamp truly excels in their available communication and mobile collaboration tools. Communicate directly with one person via built-in chat, gather a group of people to chat around a Campfire, share a file, collaborate on a document, or bookmark with anyone you want, even call someone out for specific praise. Additionally, Basecamp’s newest feature, “Clientside,” allows you to give limited access to the Basecamp system to your clients. However, I’d take a long look at their security policy before having too many privileged conversations. Mobile/Remote Communication & Collaboration Tools. Clarizon is a project management tool built on the concept that everyone’s needs are a little different. So they designed one of the most customizable project management tools on the market. Among those tools are a huge list of templates, resource management applications, and communication options. Using a modular design and an open API, the options are nearly limitless. Clarizon also boasts impressive reporting and analytics tools, allowing you to adjust your project roadmaps and plans both in real-time, as well as for future projects. Additionally, no project management tool on the market boasts the third-party app selection available for Clarizen. Infinitely customizable – from the dashboard, to the reporting, API, and massive third-party app library. LiquidPlanner is the Tony Stark of project management tools. Although it describes itself as primarily a tool for IT and Technology companies, there is a LOT for law firms and professional services firms to like about LiquidPlanner. Using “Predictive Project Management,” LiquidPlanner creates your workflows, task lists, and schedules automatically, based on your project’s priorities and predicts the completion. Constantly learning from your team’s performances, you get accurate Best/Worst case scenario reports and estimates, and LiquidPlanner will automatically adjust whenever there’s a change. It’s worth noting, however, that along with a steep learning curve, LiquidPlanner also lacks some of the communication tools, particularly a chat feature, found in other practice management tools. Powerful analytics, “Predictive Project Management,” and automated workflows. Specializing in professional services project management, Mavenlink offers a high-level project management tool based on business intelligence. Like LiquidPlanner, Mavenlink seeks not only to help you complete tasks, but to improve on your workflows going forward. The built-in business intelligence and timeline charting tools allow for rapid adjustments to changes in a project, and the “Project Workspace allows users to manage projects from the tiniest detail to the 30,000 foot view. However, the real power comes by combining Mavenlink’s Insights with the project management tool. Using Insights, you’ll get a state-of-the-art business analysis tool, giving you information on trends and issues impacting your project so that you can respond quickly. More than just a data analysis tool, Insights helps you understand what is happening, why it’s happening, and what you can do to fix it. These insights aren’t cheap, however, and require the premium subscription. What the previous two project management tools have been for enterprise high-tech, Podio is project management for the little guy. Designed specifically for small businesses, highly customizable, Podio uses a modular system to provide only what your law firm needs. However, just because it appears to be for the little guy, Podio packs some impressive tools. Along with the regular project management system, Podio has a powerful workflow module, providing hypothetical scenarios. In other words – at small company prices, you can actually get some of that expensive predictive tech! As with most great modular systems, Podio integrates with a ton of third-party apps. For lawyers, there’s one add-on that truly stands out: robust CRM tools. Unlike the other project management tools on this list, Podio allows you to combine your client management and your project management into one program! Highly Customizable; CRM and Social Intranet add-ons available. SmartSheet takes a unique approach to project management. As a company that originally created spreadsheets (which are incredibly powerful, if you know how to use them… and have the time), SmartSheet took the databasing capabilities of those spreadsheets and applied them to project management. SmartSheet is powerful exactly because anything that can be done on a spreadsheet can be done here. Moreover, combining project management with the data and formula capabilities of spreadsheets means anything that SmartSheet can’t do out of the box (like time tracking and billing), can be added if you have the wherewithal to do it. SmartSheet also lacks a chat feature, and doesn’t offer a pre-set place to view assigned tasks. On the other hand, significant collaboration tools are available, there are multiple third-party apps, and a robust API is available. If you are a visual person, and you’re looking for a simple, inexpensive project management tool, then Trello is probably right up your alley. Boasting all the basic project management and collaboration tools you’d expect, Trello packs it all into an easy-to-use system based on a whiteboard concept. Utilizing the whiteboard, you place “cards” (think Post-It Notes) and lists instead of the folders, milestones, and tasks of other systems. To some, it will seem like Trello is missing a lot of the features you’d expect in a project management tool. For example, there is no best/worst-case scenario estimates, there’s no progress chart for tasks, and there’s no timer. However, one of Trello’s biggest strengths is its flexibility and its simplicity. At its core, Trello is probably more about collaboration than actual project management, but it’s got the tools to get the job done. If there are two basic tiers of project management tools, the basic and the advanced, Wrike seems to fit snugly right in the middle. Boasting considerably more options than the basic systems like Asana and Trello, it lacks many of the more advanced tools found in LiquidPlanner and others. For example, Wrike allows you to track the time you spend, but doesn’t have a built-in time-tracking or billing system. You have numerous due-date options, including multiple-day options, but cannot indicate a specific time. Wrike’s Timeline and Workload Chart are interactive, but don’t automatically adjust workflows in response to changes or provide best/worst case scenarios. One area where Wrike really shines is the support they provide for their APIs and the availability of valuable third-party apps. As with most great systems, Zoho Projects makes the difficult seem easy. Right from the start, the Zoho interface is simple and straightforward. Or so it seems. Everything you need is only one click away. Well, that’s because Zoho employs a responsive system – changing what you see on screen based on what you’re doing. A social media-style activity feed keeps you constantly updated on the goings-on in your team. Need to speak to someone? Well, there’s a chat app, but sometimes you need face-to-face. Good, there’s video conferencing too! Zoho also has reporting tools that utilize advanced analytics and business intelligence to provide important information regarding your projects. Utilize any of the 50+ reports available to analyze your performance, identify potential improvements, and put them into action. Finally, Zoho is one of the only project management tools on the market that actually offers a truly free trial! Take advantage of it! Overall, the best combination of project management tools in one platform. While technically Slack is a messaging system, it’s already making big gains among small and medium size businesses as a component of collaboration and project management initiatives. Scuttlebut says that Slack isn’t satisfied to remain just a messaging program, though. Look for robust practice management options in the future!